I booked a last-minute ticket to the Queensland Writers Centre’s (QWC) Going Indie seminar, unsure what I was going to hear, but hopeful it was going to be applicable. I’ve had good fortune with QWC’s workshops and figured this one, which was tackling the oft-sneered-at, but increasingly decent option of self-publishing, would offer a handy industry-in-flux oversight. I have to say, though, that I hate the term ‘self-publishing’, so was relieved when the panellists swiftly renamed it ‘indie publishing’, as in reminiscent of the respected independent music industry. I turned up largely to hear Sally Collings*, esteemed writer, editor, and publisher, and person self-described as being able to offer a 360-degree view of the publishing process and industry. In fact, I’d have turned up just to hear her speak—her wisdom, warmth, out-of-the-box, and ‘unashamedly commercial’ approach to non-fiction publishing are something I’d love to learn from and perhaps one day emulate. Indie publishing appeals to control freaks who like to be in charge of the project from start to finish (hello, me! ), as well as people who are authorities in their niches, have direct links to their audiences, and who know more about the subject than any publisher would. Indie publishing enables you to be creative and task risks you couldn’t within a traditional publishing framework. No matter what you do in publishing, you must be your own gatekeeper, i.e. whether you’re self-publishing or being published by a traditional publisher, be sure you’ve done your best work. An independently published book must never look like one—quality design and content are a must. Because self-publishing’s easy, everyone’s doing it, which means there’s a bunch of competition and noise out there. It is levelling off, though. Indie and traditional publishing aren’t mutually exclusive. You can do both, and both at once if it works for you. If you do self-publish, it’s key to have a marketing strategy. You should invest in the writing community of which you’re a part as the engagement, support, and advice are critical. The fundamental thing is the writing. It never occurred to Baxter that he was independently or traditionally publishing—he was just writing. Just because you can, doesn’t mean you should. As noted above, quality is key. It’s possible to source cover artwork from such sites as 99 Designs, which also allows you to create Facebook polls for friends and fans to vote on, i.e. developing awareness of your book before it comes out. Postage costs in this enormous land of Oz we live in needs to be factored in. Baxter’s example was that his book was a mere (but fiscally painful) three grams over the minimum postage weight. It meant that he had to spend hundreds of dollars on postage he wouldn’t have needed to had he printed the book with a font 0.5 px smaller than the one he did use. Don’t be afraid to give work away—writers such as Cory Doctorow have built strong careers based on this philosophy (but don’t give your rights away if you can help it). The only thing worse than piracy is obscurity. The people who’ll pirate your work weren’t the ones who’d ever have paid for it anyway. If they have it, they might read it. If they read it, they might like it and mention it to others. Those others might actually buy it. While the session was ultimately positive, I was pretty disappointed to hear that Nunn wasn’t publishing to make money. A bestselling poetry book sells, he told us, 500 copies nationally. That’s a woefully low figure and it’s probably just as well he’s not after commercial success—that’s a huge obstacle to overcome. Still, the glass-half-full way of looking at that is that he’s not letting it put him off and he’s publishing because of his poetry passion. Like Collings, I’m unashamedly commercial about my intentions—people don’t practise law or medicine for the love of it and don’t feel squeamish about getting paid for their expertise. I’m still just trying to 100% work out how to produce commercially and critically successful non-fiction work. After today’s panel, I don’t think indie publishing is the answer, but I do think it has an important supporting role to play. 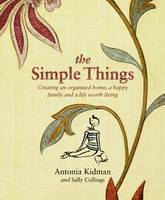 *Her latest book is The Simple Things, which she co-wrote with Antonia Kidman. **An interesting side note: After reading some woeful efforts, Baxter saw a need for a book offering some pointers for writing action and fight scenes—something his expertise well-positioned him to do so. It continues to tick over on Amazon. I’ve long been interested in setting up my own small press, mostly because I’ve seen the way the industry is heading and at least partly because the free tools now exist to largely go it alone. I’ve been even more mostly interested (if you get my meaning) because I’ve admired how the uber-talented Dave Eggers has maintained control of his creative output and his profits, which is what I see as being key. When the Queensland Writers Centre announced it was going to host award-winning indie publishers Small Beer Press as part of their industry talks, I figured it was the perfect opportunity to find out more about the practicalities of setting up and running a small press, as well about its long-term viability. I mean, really, does anyone ever make a living from running their own press? Or are they just in denial about/staving off the inevitable monstering of all publishing and sales outlets by behemoths like Amazon? Kelly won a round-the-world trip by answering the question ‘Why do you want to go around the world?’ with ‘Because you can’t go through it’. Damn. Wish I’d thought of something that clever. Gavin started the zine and, subsequently, the publishing house because he realised he was never going to reinvent the world. The couple went to pubs in New York and quizzed friends who worked in the publishing industry. It was smart because they both got to drink beer and find out which pitfalls to avoid purely because their friends were willing to fess up to their own, hard-learned publishing errors. Amazon is not our friend (but we already knew that, right?). Gavin referred to it as ‘intrinsically evil’ because they want to be and control absolutely everything everywhere. Kelly referred to it as ‘evil, but very, very smart, which is the worst combination’. I’m inclined to agree, with Amazon taking cuts left right and centre—including a cut per book sale for marketing/advertising, even if they’ve effectively done none. Working in the industry is ‘a bit like working with a manic depressive’. You wake up and go: ‘Oh look, Amazon has eaten somebody else’. Sigh. I can even recall where I was when I heard Amazon had absorbed The Book Depository. Technology has made a lot of things possible. The question is whether the large publishing houses will be able to adapt and take advantage of these fast enough (yes, indeedy it is). The ‘small beer’ in the name was a reference to ‘small beer now, large beer later’. Were they to start again, they’d probably name the press something to do with super heroes. Random House have a sneaky clause in their contracts that says if they sell your books at a discount, they get to halve your royalties from those sales. Aim for ‘covers with narrative’ when designing cover art. The emergence of lots of similarly looking covers might be a subtle effort to group like titles together, e.g. the iconic (yes, I just used that to describe the following) Twilight and Lovely Bones covers were incredibly successful and spawned a whole raft of similar designs. Nobody reads a manuscript in the office. They read it on public transport or at home. Gavin and Kelly are experimenting with the submission guidelines, asking writers to send in just three pages. You know, they say, whether the writer knows what they’re doing within the first page. You know if you want to maybe publish them within the first three. Disappointingly, they’re not in any way across social media. That’s perhaps the part I most wanted to know—how they’re utilising free online tools such as these to promote their press and publications. I get the sense that they’re living a bohemian lifestyle on a ramshackle farm in Massachussets. There’s nothing wrong with that, but it signalled to me that they’re not quite making enough money to make it viable financially. Which is not the answer I wanted. As far as I’m concerned, it doesn’t have to be a goldmine, but it does need to pay its own way. If one person likes and publishes your story, that’s enough—it’s all you’ve ever really been looking for. Clear as mud? Yeah. Gavin and Kelly were pragmatic and witty and insightful (I laughed often and loved their way of looking at and framing the world), but the talk wasn’t quite as inspiring as I’d hoped.